Even when it isn't Valentine's Day, we should all feel the love in a home when we enter. It's important to be able to express your clients' soul in their surroundings when you create a design for them. As designers, we should think of ourselves as instruments for bringing harmony in design, while not stifling the clients' spirit by infusing too much of our own. Bring out the love in your designs that will make your clients' hearts shine. You might consider creating an art wall display of the family's collection of African masks or making accent pillows from a treasured antique fabric the family has saved. Framing a child's or grandchild's art in shadowboxes down a hallway is always a heartfelt hit. As artists, we can all come up with more amazing ideas if we just give it a little thought. I believe a well-designed home comes from utilizing the expertise of an interior designer to capture the heart of the people who live there. Interior designers, let's all remember to nurture our souls as well. When I am designing several residences and enjoying a bountiful income, sometimes something else happens that may not be so wonderful... I forget to smile when I come home and enjoy my loved ones that make my world possible. Let's nurture our souls and take care of the "golden goose." Happy Valentines, with much love and happiness to you and yours! Please join us in welcoming member relations expert, Karen Gleason, the newest addition to our DSA staff. About the time Karen joined us, we realized that many of our members are not taking advantage of their free online portfolio. The Designer Society of America website features a section for consumers searching for a designer in their state, but very few members currently have an active portfolio with photographs posted on our site. Designers often pay thousands of dollars to have a website created to promote and market their work. As a DSA member, you have the option of loading up to 80 project photographs, with descriptions, to this online portfolio - at no extra cost! This service is included as a member benefit. In addition, you can include a link to your own website if you have one, giving consumers even greater insight to your experience and past projects. We realize our members are at a variety of levels when it comes to technology. Let us help you! Among her many other member relations duties, Karen can walk you through the process or even upload the photos for you. Once the work is done, your portfolio can be accessed by anyone visiting our site. That's free advertising for your business! Don't let another day go by without your professional work being featured on our site. Remember, if a potential client can't find you, they can't hire you! Please take advantage of this feature. We've spent a great deal of money to provide this free service and would love to have every one of our members using it to their benefit. If we're going to grow and earn a lion's share of this industry, we need to put the word out about the great design work our members do each and every day. So let's get busy! Karen Gleason can be reached at (229) 886-3746 or by email at karen.gleason@dsasociety.org. Space is running out for the upcoming School of Graceful Lifestyles (TM) five-day certificate course in Feng Shui ReDesign. Organized especially for members of Designer Society of America, this course uniquely integrates the principles of Feng Shui and green design with interior decorating and home staging. 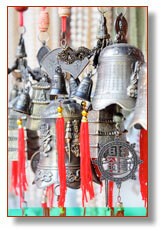 Your new Feng Shui design skills will add confidence and generate additional revenue streams for your business. This program is ideal for the Feng Shui professional and interior designers looking to enhance their business. The program will provide the tools to enhance and support a new career opportunity in the interior decorating industry. Save $300! Special DSA member tuition rates available for a limited time only! The certification class will be held in sunny Orlando, Florida, March 24-29. To register, call (321) 939-2774 or click here. Cupid's Arrow or Feng Shui? In Feng Shui, you are connected to your possessions and they require that you clean, store and care for them. Each object you have should enhance your life. Veggies with almost a decade long past due date do not qualify! After dating for two years, I wanted to enhance my relationship with my boyfriend and for us to "make more room" for each other in our lives. I first cleaned and clutter cleared my own home and then, with his enthusiastic co-operation, started to do his. This is what led to my discovery of the frozen artifacts. I also organized the jumbled mess in a closet that was in the "relationship" area of his apartment. Within a few weeks he started talking about us moving in together; now we are purchasing our own home. Cupid's arrow or Feng Shui? I prefer to believe the latter. Small adjustments often result in big changes! *We moved into our new home last September! Success Strategies: It Takes a Village to Be a Success! Find Yours. Stuck in Learning: All too often we spend our time in business development, taking teleclasses, attending seminars, reading the latest special report and we forget it isn't in what we know, but in what we act on that our success is truly made. You can have all the talent, all the expertise, and all the best tools but when you don't use them, when you don't market them, when you don't share them, they are pretty worthless. The Antidote is Action: Have you ever noticed that it isn't always the best artist that gets famous, or the best designer that gets published, or the best athlete that wins the medal but the one who took persistent and consistent action to move their dream forward. There are a lot of incredibly talented people languishing at home because they are stalled by inaction. They have the talent but they can't seem to pull the trigger. Get the Support You Need: In your case, you may know but need the expert guidance and accountability of a group, like a mastermind, to truly drive you forward. You may be waiting for a coach or mentor who can show you how to put the pieces together that you have and hold you accountable for moving forward. We all make excuses to ourselves all day, but are infinitely more likely to get 'er done when we have committed this to someone else. Find Your Village: The right coach, mentor, or mastermind can truly unlock your greatness. They provide the guidance, the path, and the support necessary to move you forward. You know your industry, you are an expert in your field but you lack the systems, the framework, and the essential tools to fit all the pieces together in a winning whole. Or you just need that special person who can see your forest for your trees! It truly takes a Village of people to create success for any one individual. 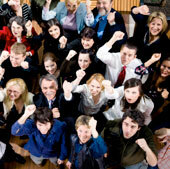 Do you have a Village to support you, hold you accountable for goals set, and to celebrate your successes? Don't let it be lonely at the top, take your Village with you! Are you ready to find YOUR Village and grab your piece of the success pie? Check out www.todaybydesign.com for more great business building tips. And go to www.businessrenovationmastermind.com to find a village to support you. Together we'll all go farther. In January, I suggested setting goals for a New Year's Sustainable Resolution, including education and implementation. 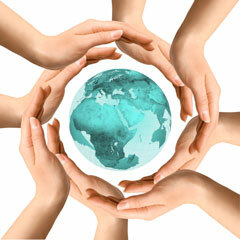 But the amount of available information regarding sustainable design can be overwhelming. Sorting through it all and fulfilling the educational piece of your resolution can be a daunting task. So, for the next couple of months, I'll share a few of my favorite books to help narrow your search. "Silent Spring" brought environmental concerns to the attention of the general public when it was published 42 years ago and set the stage for the sustainability movement we're experiencing today. It's an easy read from a technical point of view because author, Rachel Carson, makes it accessible. She writes of the variety of chemicals added each year to the barrage let loose on our world, explaining the chemicals so that laymen can understand their compositions and impacts. Effects to water, soil, plants and animals are also described. Carson discusses the way humans respond to hazard, often ignoring it if not at crisis levels. Following that observation are examples of the long term and interrelated consequences of chemical exposures that are sometimes subtle, often times complex, cumulative or distanced from the chemical exposure by long spans of time. We're left to come to our own conclusion and take up the challenge of changing the way we respond so that it is appropriate to the types of threats that we face. Carson gives a multitude of accounts of ecosystem damage from around the country. You may find one that is as close to home as I did. The use of DDT was first thought to be harmless, yet the devastating effects of it were felt in my home state of Michigan, in the capital city of Lansing. On the campus of Michigan State University, in the early 1950's, DDT was used to kill a beetle that carried a fungus to elm trees causing Dutch Elm disease. The DDT worked its way into the food chain from leaves of sprayed trees to earthworms in the ground below. Later, robins ate the poisonous worms and died or became sterile. The lack of birds singing in the spring is the basis for Carson's title, "Silent Spring." As I read "Silent Spring," I often felt the urge to research the abundant examples and see where we are now. I know that DDT was banned from production and use in the U.S. The bald eagle was recently taken off the endangered species list, a list that exists at least in part because of Rachel Carson. And, as I carried this book with me to doctor's appointments and outings, I often heard from people the anecdotal evidence of its lasting impact. "Oh, that book by Rachel Carson, the one that got DDT banned." Even many people, who, like me, had never read "Silent Spring," knew of it and its power. Every book I've read about sustainability has referenced Rachel Carson and her incredible work. It's a must read for anyone interested in understanding the history and roots of the sustainability movement today. Recently, we became aware of positions and statements originating from the staging profession, purporting that regulation of interior designers does not affect real estate/home stagers and they should not become proactive in protecting their freedoms. This is not only far from true, but is a dangerous position that could potentially place real estate stagers at great risk. Practice laws in states like Florida and Alabama have been a detriment to real estate stagers, and if similar practice acts are allowed to be enacted, stagers will continue be impacted. Sadly, the advice which has been given to stagers recommending that they do not look into this issue lacks a clear understanding of the nuances of regulation. It appears that the objective lies in self-promotion rather than member protection and serves only to encourage stagers to withdraw back into complacency instead of continuing to actively engage in this important issue that has and will continue to impact staging professionals if left unchecked. 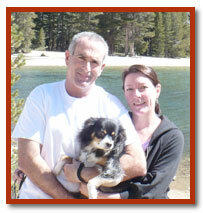 "I am remodeling my bathroom at home and was wondering what paint color makes you look your best. I have a friend who has taken some interior design classes and told me that green tends to make people look and feel sick; therefore, I changed my initial plan. Here's what I see as a way to think about paint color for your bathroom. Start with the end result in mind. 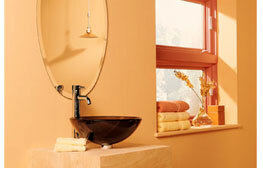 This will help you narrow your color choices and then you can focus on finding just the right hue for your bathroom. If this is a guest bath and your goal is to create a backdrop that is flattering for anyone when they look in the mirror, then consider paint tints or tones inspired by skin tones. These would be hues in the peach to pink to warm beige or soft tan. These are colors that easily flatter just about everyone, no matter their coloring. For hair salons and other professional establishments, I almost always recommend that they go the pinky-peach route because most people will look great surrounded by it when looking in the mirror. When your business is making people look good this is exactly what you want a customer to think when they glance in the mirror to see their freshly styled hair. You could also consider a color like turquoise that looks good on everyone too, but this may not be as easy a color to work into your decorating scheme. For a guest bath, however, you might have the desire to chose a color that makes a decorating statement. 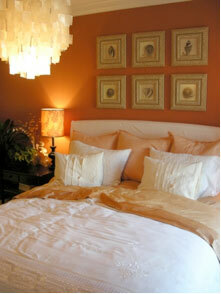 That can work well and often a rich or dark color that accents your decor can turn your guestroom into a little jewel. No need to worry about whether the color flatters your guest; they will probably be too busy admiring your beautiful decorating scheme to be looking at themselves anyway. Just choose a color that feels great to you in the room and make the statement you have in mind. One thing to note, however, about color that makes a statement: Colors that are very vibrant will seem to bounce off the walls in a small room and you and your guest might feel the same way. If you really want a bold, bright color in the bathroom, consider it on just one wall and use artwork or accessories to bring in more of the same or other bold colors. Make it your perfect color! Your friend is right that greens and yellows, as well as many other colors, can be unflattering for some people. For your private bath, however, you can easily go with any color that flatters you...even green if that is a color you normally wear and feel great in. If you share the bath you could pick a color that looks great on both of you or at least consider it...you are the one picking and painting after all! Kate Smith, CMG, CfYH, DSA and Kiki Titterud, Allied ASID, CMG, CfYH, DSA, both recognized authorities on color, train design professionals through the accredited Color for Your Home Color Consultant Certification for Interior Designers program. "Appropriateness is the foundation for the ultimate success of any well decorated room. Every room in a house should be used; if it goes unused I haven't done my job," says Bruce Norman Long, who has worked extensively throughout the United States and abroad and is internationally published. His greatest pride has been his long standing relationships with his clients. Long, who never uses the same fabric twice, launched his eponymous company in 1993 after working for the infamous Mark Hampton. This experience, along with an architectural degree from Rhode Island School of Design and being born into a family of antique and art collectors, gives Long his comprehensive knowledge of interior design. "With a logical eye and careful editing, good design can be found everywhere, from custom to catalog," he says. 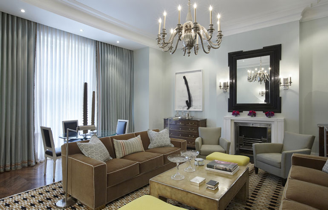 Bruce Norman Long is a full service interior design firm, working internationally, with offices located in New York City and Princeton. The firm offers hourly consultation services as well as full scale contractual services to meet all of their client's design needs, from a single room to complete architectural plans for interior, exterior,and landscaping. 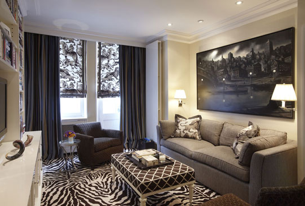 The firm's staff of designers, production coordinators and project managers works closely with a stable of custom workrooms and vendors to create a home for clients that is uniquely their own. Long donates much of his time to charity and has participated in the Kips Bay Boys and Girls Club Decorator Show Houses, The Junior League of Greater Princeton Show Houses, as well as the Vassar and Buck's Show Houses. He serves as a trustee for the James A. Michener Art Museum, was a long time co-chair for their Business Partner Advisory Program and is active in a number of other community efforts.